I have been struggling with mental illness since I was 10 years old, ranging from body dysmorphia to anxiety to bipolar. I work in a hospital and have only recently started to speak openly. My mother died when I was one year old and both she and my grandmother suffer from mental illness mainly depression and addiction. A few weeks back, somebody at the hospital where I work took their own life. This shocked me and made me realise that more needs to be done to encourage people to be more open about mental illness. I started volunteering for Time to Change last year at London then the Brighton pride this year. I enjoyed both days but my day in Brighton gave me more confidence as I travelled on my own by train for 2 hours each way. Normally I wouldn't go anywhere on my own without panicking. I wasn't sure what to expect as it was a lot bigger than the London Southbank. I learnt a lot and gained more knowledge and put my own prejudices away plus met some more wonderful people. 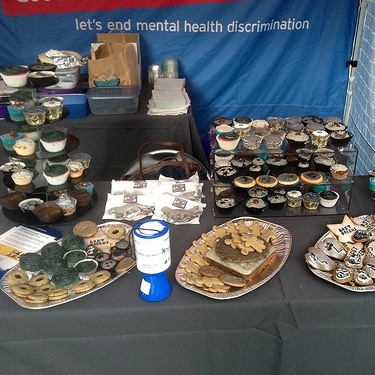 I also volunteered at the Cambridge Village in September and I was so excited that I offered to make some cakes for the depressed cake shop. I have made some and gave them to the people I work with. I have usually tried to hide my bipolar from them as I thought that they wouldn't understand plus I had been told that no one cared about me there by one member of staff so I kept quiet. Until I brought my cakes in they were asking why I made them and why they were grey. I explained what I was doing and they were extremely supportive of me. Even the person who said no one cared said my cake was yummy. I am hoping that I will be able to volunteer more often and help others suffering plus hope that my confidence will carrying on growing and maybe one day take information about Time to Change into the staff room. But one day at a time. I would like to go into schools and companies as well to encourage more people to talk more openly about mental health.